The pancake is more versatile than you think. It's good for breakfast. It's good for dinner. You can use sweet ingredients, savory ingredients or both. If you're ever looking for a vehicle to serve Biscoff spread, peanut butter, Nutella, or jelly (other than a spoon), a pancake is the way to go. If it's just a snack for you, make a very small serving of pancake mix. For these little sammies, I used a half cup of dry pancake mix (Krusteaz Honey Wheat), and mixed with water until I had a nice, thin, smooth batter. 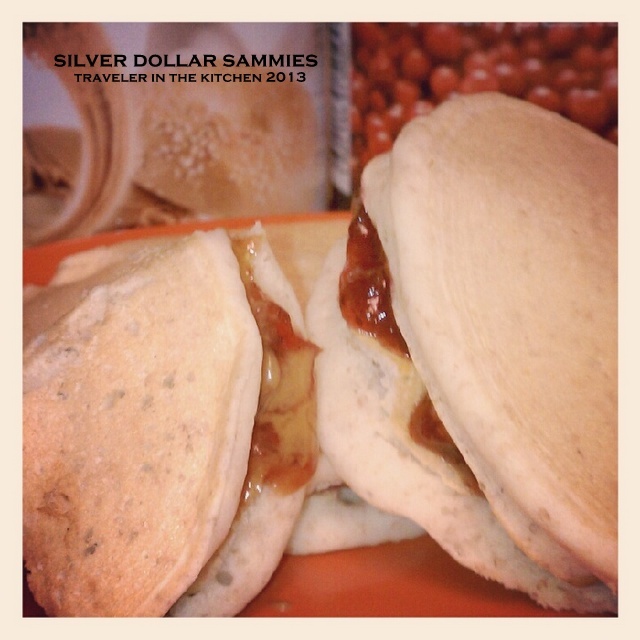 It made 10 silver dollar pancakes - for 5 perfect little pancake sandwiches. Heat up your griddle. Pour the batter using a 1 tablespoon measuring spoon. Grill until the pancake bubbles then flip it over. Once you take your little pancakes off the griddle, it's time to dress them up. I made mine using Biscoff spread and Lingonberry preserves. They are delicious hot off the grill or the next morning for breakfast. And next time? I think they'll be delicious with some bacon. A PBB&J, if you will.